Volcanoes are mountains which are connected to the molten rock in the center of the earth. There are three types of volcanoes: cinder cone, shield, and composite cone. Each kind of volcano forms in a slightly different way but each one can erupt with amazing force. 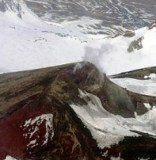 Because of their unpredictability, forecasting volcanic eruptions is an inexact science for those at the Alaska Volcano Observatory, an organization made up of a team of researchers from the U.S. Geological Survey, the UAF Geophysical Institute and the Alaska Division of Geological and Geophysical Surveys, with centers in Fairbanks and Anchorage. Most all of Alaska's volcanoes are located along the 1,500 mile Aleutian Arc that extends westward to Kamchatka and forms the northern part of the Pacific Ring of Fire. 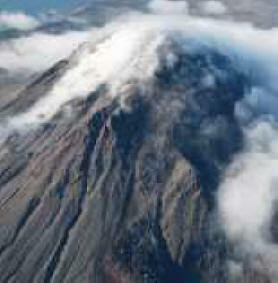 Akutan is one of the most volcanically active islands in the eastern Aleutian arc. 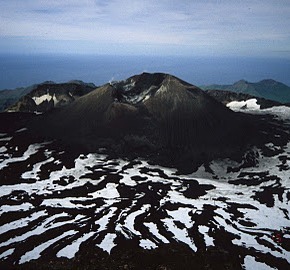 Akutan is a fairly small volcano but unlike Shishaldin it has a huge caldera. 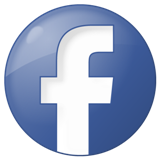 Akutan Volcano is a stratovolcano on Akutan Island in the east-central Aleutian Islands of southwestern Alaska. Akutan Volcano is located on west-central Akutan Island, southwest of the tip of the Alaska Peninsula. The communities of Unalaska and Dutch Harbor lie to the southwest. Akutan's summit contains a 2 km diameter caldera. At least three lakes are inside the caldera, The largest lake has an area of about 1.5 square kilometers. 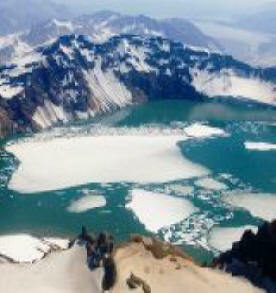 Perennial snowfields ,ice cliffs, and small glaciers also are present within the caldera. Topographic maps of the volcano show small valley glaciers extending from the crater rim. The caldera is breached on the northeast side and recent lava flows and lahar deposits extend from this area down valley. There are no other breaks in the caldera rim. At least 27 separate eruptive episodes have been noted since 1790. 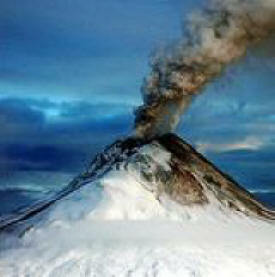 Eruptions at Akutan volcano are typically moderately explosive, short-duration, and Stromolian, lasting for a few weeks. Hazards at the volcano include ash clouds, ashfall, volcanic bombs, pyroclastic flows, lahars, lava flows, and debris avalanches. 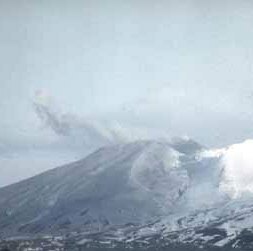 Recent eruptions produced only small amounts of fine volcanic ash that fell primarily on the upper flanks of the volcano. Small amounts of ash fell on the Akutan Harbor area during eruptions in 1911, 1948, 1987, and 1989. Plumes of volcanic ash are the primary hazard associated with eruptions of Akutan Volcano and are a major hazard to all aircraft using the airfield at Dutch Harbor or approaching Akutan Island. Eruptions similar to historical Akutan eruptions should be anticipated in the future. Although unlikely, eruptions larger than those of historical time could generate significant amounts of volcanic ash, fallout, pyroclastic flows, and lahars that would be hazardous to life and property on all sectors of the volcano and other parts of the island, but especially in the major valleys that head on the volcano flanks. 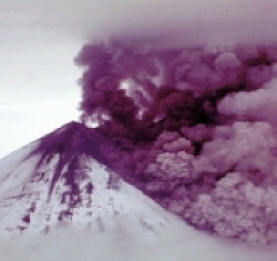 During a large eruption, an ash cloud could be produced that may be hazardous to aircraft using the airfield at Cold Bay and the airspace down wind from the volcano. In the event of a large eruption, volcanic ash fallout could be relatively thick over parts of Akutan Island and volcanic bombs could strike areas more than 10 kilometers from the volcano. A lava flow in 1978 traveled through a narrow breach in the north caldera rim to within 2 km of the coast. A small lake occupies part of the caldera floor. Two volcanic centers are located on the NW flank: Lava Peak is of Pleistocene age; and, a cinder cone lower on the flank which produced a lava flow in 1852 that extended the shoreline of the island and forms Lava Point. An older, mostly buried caldera seems to have formed in Pleistocene or Holocene time, while the current caldera formed in a VEI-5 eruption c. 340 AD. The volcano erupted most recently in 1992, but there is still fumarolic activity at the base of Lava Point and there are hot springs North-East of the caldera. Akutan is a wonderful destination for ecotourism. Hiking on the island is diverse-wildflowers and berries abound on the hills and mountains. There is a thermal hot springs within hiking distance of the village. 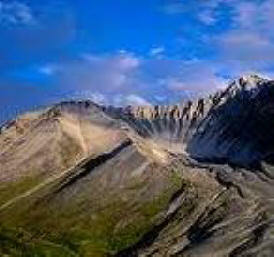 Hardy souls have climbed all the way to the crater of Akutan volcano, which is about seven miles west of the village. 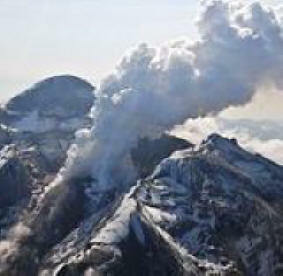 The volcano is active, with steady steam emissions and an occasional dusting of volcanic ash. There are no bears on the island, although you can see an occasional fox, and Akutan and the surrounding islands teem with birds and sea life. The whiskered auklet is found on the nearby Baby Islands, one of only two places it exists in the world. Fishing is excellent in the waters around Akutan, and some of the largest halibut in the world have been caught in Akutan Pass at the west side of the Island.